German chocolate cake has always been one of my favorite cakes. I like it because of the frosting. Who even needs cake when you can just eat gooey icing laced with coconut and pecans? I would be down with eating a big bowl of German chocolate cake icing if that didn’t mark me as a glutton. 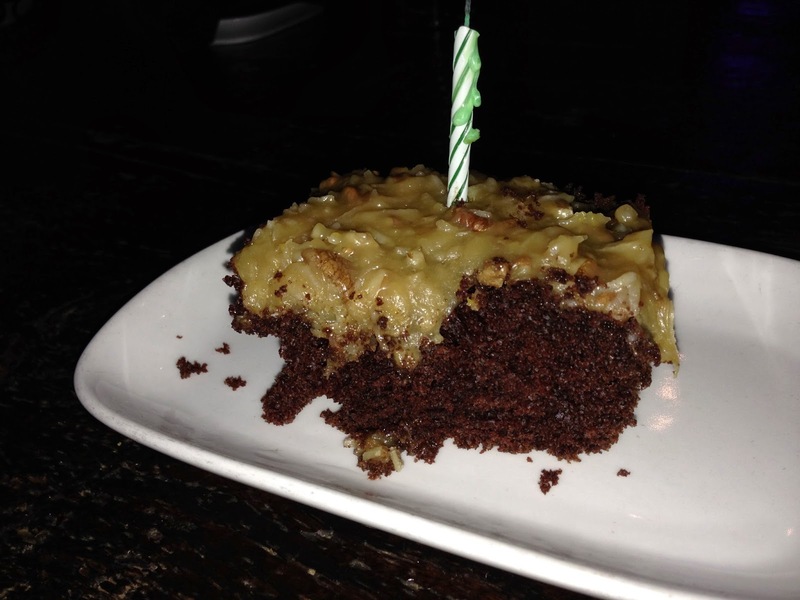 A complaint I have about German chocolate cake is the actual cake. For some reason many German chocolate cake recipes have a weak, bland chocolate cake. An amazing icing is no excuse for a wimpy cake. I made this cake for my birthday, and so I had no patience for a bland cake. I wanted a chocolate cake that could stand on its own and be applauded for its own merits. This cake did not originate in German. It’s such a deceptive name. It was named after Sam German. In 1852 Mr. German developed the baking dark chocolate sold by the Baker’s Chocolate Company. 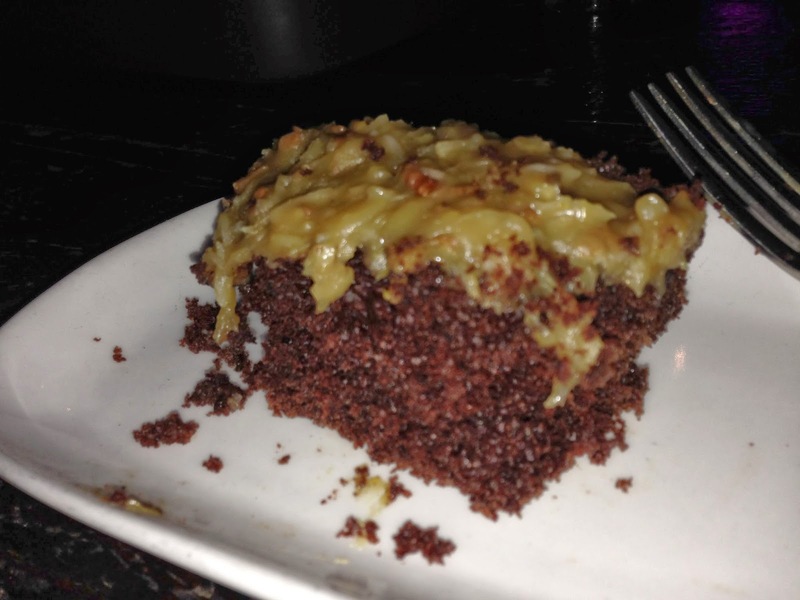 The first German chocolate cake recipe appeared in the Dallas Morning Star in 1957. Mrs. George Clay, a spritely and imaginative homemaker, created the recipe. The Baker’s Chocolate Company distributed the recipe throughout the country. Now that you know more about its history than you ever wanted to know, let me share with you the details of this version. I used a chocolate cake recipe from the blog Add a Pinch. I made it exactly as directed. I made a slight alteration to the icing recipe from All Recipes to make it a caramel version. The ingredients for the cake are 2 cups all-purpose flour, 2 cups sugar, ¾ cup coco powder, 2 teaspoons baking powder, 1 ½ teaspoons baking soda, 1 teaspoon salt, 1 cup milk, ½ cup vegetable oil, 2 eggs, 2 teaspoons vanilla, and 1 cup boiling water. I added the flour, sugar, coco powder, baking powder, baking soda, and salt into a large bowl. I added the milk, vegetable oil, eggs, and vanilla into the dry ingredients. I stirred until everything was incorporated. I then added the boiling water. When I first added the hot water the batter looks very strange. I was anxious it wouldn’t work out. The recipe says to mix the hot water and batter together for a minute. I baked this cake in a greased 9 by 13 inch pan for 35 minutes at 350 degrees Fahrenheit. I let the cake cool completely after it was baked. The ingredients for the icing are ½ cup evaporated milk, ½ cup caramel sauce, 1 cup white sugar, ½ cup melted butter, 3 egg yolks, 1 tablespoon cornstarch, 1 teaspoon vanilla extract, 1 cup chopped pecans, and 1 cup flaked coconuts. In a saucepan, I whisked together the evaporated milk, caramel sauce, sugar, butter, egg yolks, cornstarch and vanilla. I heated this over medium to hot heat and continued to stir until it was thick. This took several minutes. I didn’t time myself, but I think it took between 10 to 15 minutes. When the icing cooled, it was a little too thick. I removed the icing from the heat and added the coconut flakes and pecans. While the icing was warm I spread it over the cooled cake. This was fabulous! I give it two enthusiastic thumbs up. The cake was moist and rich. The icing was divine. It tasted a bit like caramel and was packed full of sweet coconut flakes and crunch pecans. I was a bit too enthusiastic in cooking the icing, but I would highly encourage you to make this cake. This was my birthday cake, and it lived up to the occasion.